Because you are reading this movie review on a tech site and not, say, in the pages of Cat Fancy, I assume that you have a passing familiarity with Steve Jobs. Even if you can’t quote chapter and verse from Jobs’s biography, you likely know the highlights—that Jobs and Steve Wozniak built a computer in a garage, that they parlayed that computer into a company, and that the company they formed later produced the Macintosh and other gadgets of renown. And if that is the case—if you are perfectly well aware of these things—very little about Jobs, the newly released biopic of Apple’s late cofounder and long-time CEO, will surprise or shock you. Starring Ashton Kutcher in the title role, Jobs ticks off all the boxes you’d expect in a movie that tracks Jobs from his college drop-out days all the way up to his late ’90s return to Apple after years in exile, including a prologue about the 2001 introduction of the iPod thrown in to hint at the greater glories to come. To the masses who recognize Steve Jobs only as that guy in the black turtleneck who quite literally pulled new gadgets out of his pocket, the movie may be a revelation. To anyone steeped in the history and mythology of Apple, however, it will be a recitation of facts already entered into the record. In 'Jobs,' Ashton Kutcher has the unenviable task of bringing Steve Jobs to life on the big screen. But will Apple fans at least find Jobs entertaining? Even at a run time that’s just a few ticks over 2 hours, the movie zips along, though things do begin to lag when the action shifts to the board room machinations that led to Jobs’s ouster from Apple in 1985. For a scripted drama, it includes few head-slapping errors likely to dampen your enjoyment of the picture (though admirers of Jef Raskin may do a double-take to see his role in the creation of the Macintosh reduced to that of “officious functionary”). Remove the baggage that comes with documenting Steve Jobs’s life from the equation, and this is a pleasant though not particularly moving biopic about a visionary’s attempt to show the rest of the world what personal computing could make possible. If that sounds like a tepid endorsement, it’s only because Jobs never breaks free from the “And then this happened” style of narrative that handcuffs conventional biopics. Nor does Jobs seem to want to turn convention on its ear—an odd choice for a movie about a man who made his mark by refusing to put square pegs in the corresponding holes. Several half-promising plot points bubble up to the surface in Jobs—the joy of creating something, the friendships ending in betrayals between Jobs and a rotating cast of characters, and ultimately a love story between a man and the company he helped build. But the script abandons these elements almost as soon as they appear, and the movie makers’ focus returns to marking off spaces on the Steve Jobs biography bingo card. Jobs sitting enraptured during a class about fonts? Check. Jobs tricking Woz out of his share of a bonus for developing Atari’s Breakout? Check. Jobs showing off the “1984” Macintosh commercial in its entirety? Check and mate. “This is like a video Wikipedia entry,” my colleague Armando Rodriguez told me after we finished screening the movie. That’s a harsh but not entirely inaccurate critique. 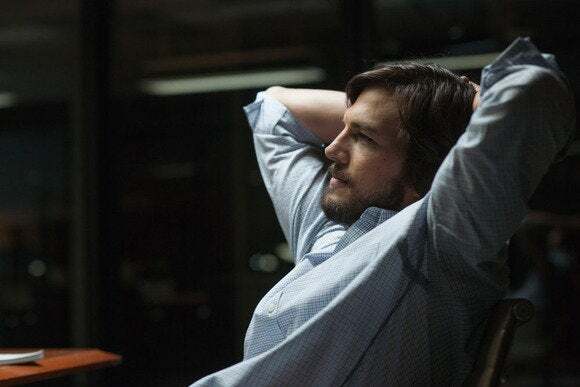 'Jobs' is at its best when it focuses on the creation of early Apple products, like the Apple II that Steve Wozniak (Josh Gad), Steve Jobs (Ashton Kutcher), and Rod Holt (Ron Eldard) are fussing over. Still, that would give short shrift to the things Jobs absolutely nails, highlighted by the energy of the scenes where Jobs and other early Apple pioneers get down to the business of building stuff. The joy of creation really comes across in the action on the screen—one of the few moments where Jobs captures what motivates people to sit in a garage and build something the rest of the world doesn’t even know it wants. Not coincidentally, this is also where the movie wrings out its most memorable performances. Ron Eldard does a brief but noteworthy turn as Rod Holt, the engineer who designed the Apple II’s power supply. But Josh Gad, cast as Steve Wozniak, steals the show. On paper, the character of Woz in Jobs barely registers, functioning as little more than the awkward wide-eyed yin to Steve Jobs’s more driven yang. But Gad infuses this thankless part with warmth and humanity. When he departs Apple for the last time, Woz gives Jobs a speech that’s top-heavy with clichés and forced Dylan-Beatles comparisons. In Gad’s hands, though, it’s a touching moment. When he leaves, he takes some of the air out of Jobs with him. Still, that’s an impersonation, not necessarily an embodiment. Kutcher never manages to fully convey his particular insight into what Jobs is all about. And for that reason, the character in the movie has about as much depth as those old YouTube clips. Several scenes in Jobs feature the title character uttering Big Thoughts about Big Things while assembled coworkers or colleagues wordlessly drink it all in. It’s Steve Jobs’s life as a decades-long Macworld Expo keynote. Boy, that would have been difficult to be around if that were really the case. Ashton Kutcher nails the cadence of Steve Jobs’s speech, but never really gets to what drove Apple’s cofounder. It’s the problem at the heart of Jobs, though. Haircut aside, the guy reclaiming his company in the movie’s final reel hasn’t undergone much of a transformation from the guy hustling to make a computer in his garage with his buddies. Once John Sculley and the rest of the Apple board conspire to give Steve Jobs the ol’ heave-ho in 1985—something Jobs would later call the best thing that could have happened to him, as it “freed me to enter one of the most creative periods of my life”—the ensuing decade is dispatched in a couple of minutes of montage. Lessons Jobs might have learned, his reconciliation with the daughter he fathered and abandoned, any vows he might have made to himself or others about what he’d do with his second chance—these things happen (if at all) off screen, leaving the audience to wonder how the enfant terrible of the 1980s transformed himself into the masterful CEO of the 21st century. Presumably, he decided to shout at people less. We could talk all day about the movie that could have been made and about how the conventions of biographical films might have been turned on their ear with a little more boldness. But we have to judge movies on what the audience is given. With Jobs, you get a workmanlike, conventional, and ultimately uninspired look at Steve Jobs and the technological revolution he helped lead. That’s a perfectly acceptable result, but an odd one considering that none of those adjectives apply to the man himself or to the products he helped build.